Hearts and Hands; Faith in Action, Inc. operates its programs and services without regard to race, color, or national origin, in accordance with Title VI of the Civil Rights Act of 1964. To obtain additional information about your rights under Title VI, contact Hearts and Hands; Faith in Action, Inc. at (716) 406-8311. If you believe you have been discriminated against on the basis of race, color, or national origin by Hearts and Hands; Faith in Action, Inc., you may file a Title VI complaint by completing, signing, and submitting the agency's Title VI Complaint Form. How to file a Title VI complaint with Hearts and Hands; Faith in Action, Inc. 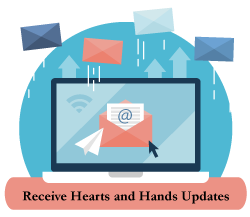 Hearts and Hands; Faith in Action, Inc. If information is needed in another language, contact the New York State Public Transportation Bureau at (518) 457-8335 or the Office of Civil Rights at OCR_TitleVI@dot.state.ny.us to arrange for the accommodation. Please allow two (2) business days to arrange for the accommodation.